Police are appealing for information after two Mitsubishi pickup trucks were stolen from a business in West Lothian. The Mitsubishi L200 vehicles were stolen from Harburn Head, West Calder, at some point between 2pm on Sunday and 3:20am on Monday. Police said the vehicles have since been used for further criminality in the Livingston area. The vehicles, which have ‘GRITIT’ written on the doors, have registration numbers DU68WXG and DY68BWP and are similar to the vehicle pictured. 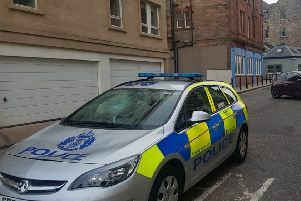 PC Marc Lunn, of West Lothian’s Community Investigation Unit, said: “Anyone who may have seen suspicious behaviour in the area, or who may know the whereabouts of the vehicles, is urged to contact either us or report this anonymously to Crimestoppers as soon as possible. Those with information can contact West Lothian’s Community Investigation Unit via 101, quoting incident number 0670 of 04/02/2019. Alternatively, an anonymous report can be made to the charity Crimestoppers on 0800 555 111.